A gift from Secret Santa ;) Happy holidays and I hope you enjoy it. Thank you so much, Secret Santa! Martha Grimes is one of my very favourite authors. Excellent novel! Lots of fun, but a serious mystery all the same. Releasing at the Lower Mainland BookCrossing Meetup in Burnaby, B.C. Found this at Burnaby Meetup. Haven't read more than one of hers so we'll see how this goes. This was good. I like the pub names for the books. There are abused children in this, and someone said this is a common theme in this series. We'll see, I'm game for more and I've now learned about turf stairs and enameled meads, what more could I want? Taking back to meetup. If no one takes it it'll be on the window shelf. Caught at the meetup. Destined for the OBCZ. Hello and congratulations! You have not only found yourself a special book, but also a whole community of booklovers dedicated to sharing books with each other and the world at large. I hope that you will write a journal entry letting me know that the book has been found. Stick around a bit and get to know Bookcrossing too – it’s a great place. Feel free to read and keep this book, or to pass it on to a friend or even to set it out "in the wild" for someone else to find like you did. And if you do choose to join, it’s free! Picked up at the Starbucks OBCZ. Have started it already. Good mystery! I would certainly like to read more in the Richard Jury series. Released for week#13(weather) of the Never Judge a Book By Its Cover release challenge and the 2007 Keep Them Moving release challenge. Placed once again on the OBCZ shelf. Good read! Enjoy! Just picked this up at Starbuck's whilst I was dropping off a book. 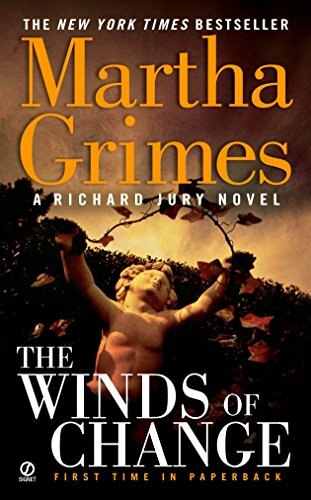 This is the first book I have read of Martha Grimes. It wasn't as riveting as I had thought it would be. I will try another of the Richard Jury Novels in the future though. Controlled release across the big pond! Not an easy read , i'm not suprised Martha Grimes is not popular in the uk . I found the stoies a littl rambling and a lot of the structure of her sentences odd. Very pleased to have found the book as it is my intro to bookcrossing. The book is now in Madeira, Portugal. The big rock sitting in the middle of the Atlantic to be exact. Having read it I am now tucking it in the small iterant liberary of the Qunita Perestrello, Funchal. Book a bit twee for my liking - sort of Lord Peter Wimseyish (as per Dorothy L Sayers.) For a final goodbye the book travelled in my pack on an organised walk of one of the Levadas or irrigation channels here abouts. It is supposed to be rugged type of walking but one lady came with silver pixie shoes and as the mud washed over our feet I thought she looked a bit peeky. Many thanks to iamagirldork for starting this book off leading to my happening upon it in Leamington Spa, UK.